Our Sanctuaries are our safe places, our places of respite, our places of protection. Sometimes those sanctuaries can be in our churches, sometimes they can be in our homes, sometimes they can be in our other hidden places. We love our sanctuaries. Those seeking refuge could find it behind this door. Durham Cathedral has a wonderful real-life example of Sanctuary. 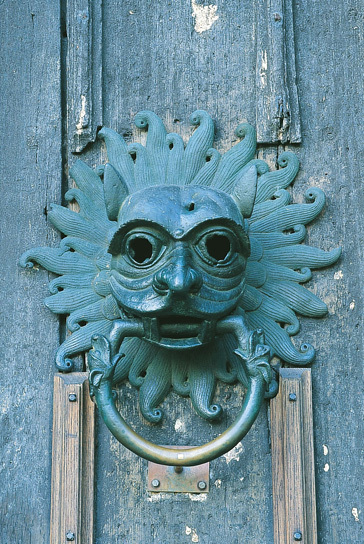 The lion head door knocker depicted here is a replica of the 12th century knocker that was on the door to the Cathedral. If one had been accused of a crime, say killing someone in self-defense, then they could flee to the Cathedral and knock upon the door. Above that door there were windows through which the monks would look for someone seeking the asylum of the church. Upon entering, the one seeking sanctuary was allowed to stay for 37 days. The person was given food, lodging, and any other necessities while there. At the conclusion of the stay, the person must stand trial or leave the country. There is biblical precedence for this–see Number 25, for example. The practice of sanctuary was abolished by the government in 1624. I wonder if our churches are still safe places for people to look solace from our “crimes.” The Bible says that all sins are grievous to God–from the “little white lie” to taking another’s life. Are our churches seen as a place where those struggling with crimes against God and others can come and seek an unconditional welcome? Though people still face the governmental legal system, do our churches welcome them as the Child of God they are and accept them with the same unconditional love? Is this a love that lasts more than 37 days? These are tough questions. I realize that they may not be easy to answer, but they are questions worth asking. Not for our sake, but the sake of the people whom God loves and may have nowhere else to turn but the Sanctuary of His Church. Why was the sanctuary period for 37 days? That is an unusual number. Trent, I wondered the same thing. I haven’t found anything in writing, but I do have a story from our tour guide. Everyone was given sanctuary for a week, no questions asked. If you surrendered your weapons, you were granted another 30 days.